Offering your baby finger foods is an important part of the weaning process, as it helps him to develop the fine motor skills and hand-to-mouth coordination necessary to pick up food pieces and feed himself. Finger foods are a great option when your baby refuses to eat anything from a spoon, and you’re looking for a quick and easy meal. I tend to like to offer finger foods for the evening meal, when tiredness sets in, and babies can often be fussy. 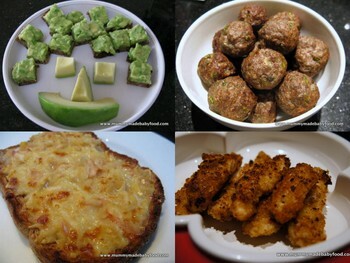 Baby finger foods are also great for allowing your little one some control over how much he eats and at what pace. This important stage of the weaning process will help build baby’s confidence to enable him to become an independent eater. Babies love to explore, so allowing yours to become familiar with the texture of the food before he eats it will give him a sense of control and understanding of what’s going into his tummy. The more you allow your baby to decide what he does and does not eat, the less likely he will become a fussy eater. Aside from the obvious store bought snack packets, many of which contain unwanted additives, there are numerous other healthy ideas for making your own baby finger foods. Below is a selection that has been popular with my little one! Remember that it is best not to add any salt to baby’s food before the age of 1, so if you are cooking for older children or for the family, make sure you set aside baby’s portion first before seasoning. Avocado is a firm favourite in our household, and my boys will happily eat it morning, noon or evening, any day of the week! Tasty meatballs that can be eaten on their own or served with tomato sauce and pasta on the side. There are endless ways to do a cheesy toastie - the apples in this one offset the saltiness of the cheese nicely. Delicious, ever popular, and so much healthier than the fast food versions. A fun way to offer baby fish, and so easy to make, you'll never bake frozen fish fingers again. Smaller and cuter versions of the traditional fish cake - also great for getting omega-3's into baby! A diversion from the traditional ingredient of chickpeas, this healthy variation of the falafel is baked, not deep-fried. Another take on the cheesy toastie, with a bit of egg and added Worcestershire sauce for good measure.